The Mercedes front row didn’t last long as the Spanish Grand Prix got underway. Lewis Hamilton lost his second place to Sebastian Vettel and quickly fell down the order. Nico Rosberg held out in the lead for a few laps, but couldn’t challenge the front-runners and was soon dropping back as well. As the pit stops began to shake out, Fernando Alonso moved into the lead of the race, with Vettel and Lotus driver Kimi Räikkönen remaining in contention for the victory. Romain Grosjean’s rear suspension failed and he had to retire from the race just nine laps in. Giedo van der Garde was also forced to retire when a wheel came loose, whilst Jean-Éric Vergne retired from damage to the car. The Toro Rosso driver was hit coming into the pit-lane by Nico Hülkenberg, who was given a 10 second stop/go penalty for the unsafe release. Pastor Maldonado also received a drive-through penalty for speeding in the pitlane. Alonso led comfortably to the end of the race, with Räikkönen holding on to second. 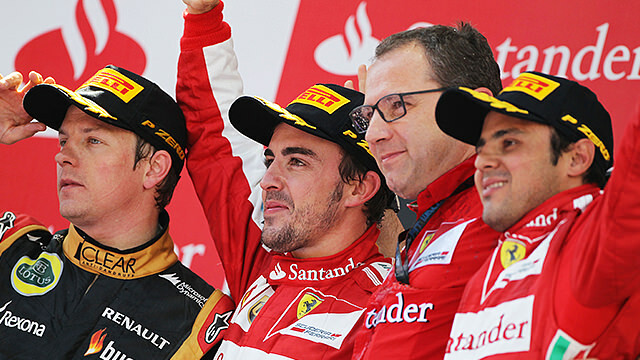 Felipe Massa managed to move up to third, pushing Vettel off the podium, and making a strong finish for Ferrari.